It is your little daughter’s birthday, so there should be no stopping when it comes to planning the perfect birthday bash. Children wait all year to celebrate their big days. Earlier, birthday parties were simple affairs with ice cream, snacks, cake and classic games like dumb charade and “pin the tail on the donkey.” Low profile party is no longer acceptable with the kids of these days. Every child now wants a memorable birthday party. Some parents throw lavish parties at expensive venues like an artist studio, five-star hotels and even on a train. Birthday party does not always need to be stressful or expensive. You just need creativity to throw the best birthday party for your kid. If you are planning your daughter’s birthday party, but do not know how to begin, then this article is just for you. Today I have rounded up some super cool ideas and themes to make your party planning a bit easier. The article includes party themes, return gifts, decoration and food ideas. Before deciding on the theme, food, venue and other party details, decide on your budget. Since the party is going to last just a few hours, the repercussions of spending more than you can afford could last a lot longer. Once you decide on a budget, select any of these ideas or themes for a fun filled, creative party. Teddy bear is one of the most favorite toys of girls. You will always find a teddy bear in a girl’s bedroom. Since the teddy bears have a timeless appeal, even the adults will have a great time at the party. Here are some ways to make this birthday party memorable for both birthday girls and their guests. Teddy bear shaped invitation cards will go best for the party. Send out an invitation to your friends and family at least five weeks before the party. Make sure you inform them about the theme. The decoration for the party should be inspired by nature. You can use wood stumps, pine codes and moss table turner for the decoration. Place some picnic rugs on the floor and dress it up with pot plants and branches to recreate the woods. Adorn the front entrance of the house with life sized teddy bear and wood stumps. Set a picnic blanket around the room and give each guest a comfortable cushion. Do not forget to give the children a brand new teddy bear. This will serve as a party favor too. 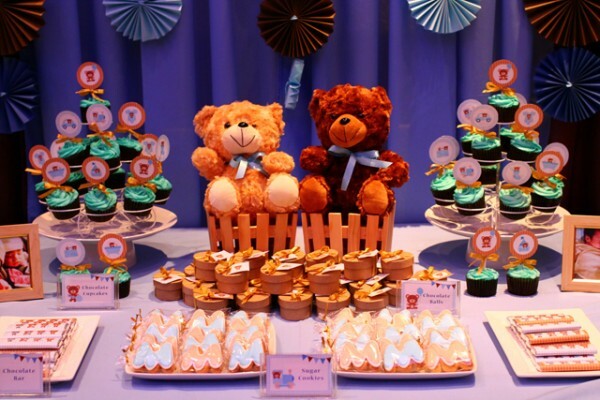 You can also give teddy bear hand bands and mini picnic baskets as favors or return gifts. A cute gummy bear cake is perfect for your Teddy Bear picnic party. You can decorate the cake with gummy bears. Use the picnic basket as a cake stand. The dining table should feature a teddy bear themed cupcakes, mini donuts, brown bread sandwich, bear, cake pops, jelly desserts, teddy bear cookies, and toadstool meringues and chocolate teddy cars. You will easily find teddy bear themed paper plates and cups at any party supply store. For party activities, you can consider games like hide and seek treasure hunt, pin the tail on the bear and bear themed coloring sheets. If reading books is your daughter’s most favorite hobby, then throw her a storybook party where she can dress up as her favorite fictional character and indulge in fun and fantasy right from the pages of her favorite books. Ask the guests to come dressed as their favorite storybook characters. Your house will be filled with little Cinderellas, Aladdins and Harry Potters. Book shaped invitation cards are ideal for this party. Take a large construction or cardstock paper and fold it to make a book. Then decorate the card with nursery rhymes and stickers of your child’s favorite books. On the inside, write the party details. Start with “Once Upon A Time” and then write a small story about your daughter’s childhood. For a memorable book character party, decorate the venue with posters of classic story books. You can ask your local library for left over posters or surf the internet free posters. Place storybooks piled up in the room and the tables. Use balloons and streamers in different colors to decorate the venue. Hang an assortment of teacups to give an “Alice to Wonderland” feel. Pack the foods and snacks in a basket to present to the little guests. You can place a juice box, a small pack of cookies, a piece of fruit and a sandwich. Tell the guests to make book jackets depicting their favorite book or characters. For this, you will need to provide them with stickers and heavy-duty construction paper. Ask the children to bring one or two of their books to hold a book exchange game. This way, each child will go home with a new book. You can also hold a musical parade featuring the tiny storybook characters after the cake cutting ceremony. Have a puppet show of a simple fairy tale or story. Ask an adult to read a classic book at the party. Engage the kids by asking what will happen next. Ask the child to makeup their story or draw pictures to tell a story. A small bag with bookmark, storybook and a clip on flashlight will make ideal party favors. These items will be easily available at your local stationary store. Kids enjoy making tiny treats a lot. One of the most popular and easy to make treats is chocolate. Chocolate was created for celebrating holidays and birthdays. So make all the chocolate lovers unite with the amazing birthday party theme. Purchase a variety of playful mold and chocolate malt flavors from the craft store. The little guests at this party will have to don their chef hats and apron for this activity. Melt the chocolate in a microwave oven and then allow the kids to get as creative as they want to be. Kids can also sprinkle chocolate flakes and nuts for a sophisticated finish. The mold will set quickly in the refrigerator. Even the cleanup will not be an issue if you put wax paper on the workstation. 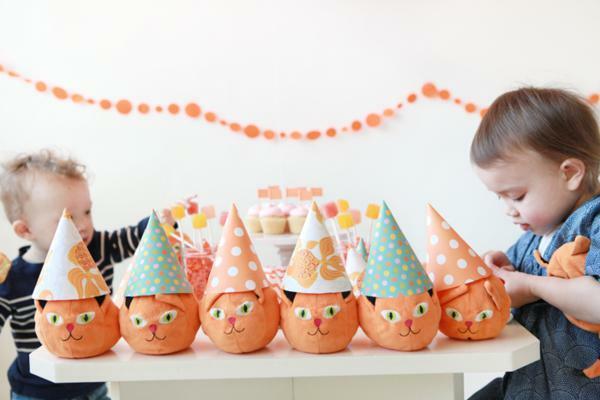 A craft themed birthday party is ideal for tweens and teens. 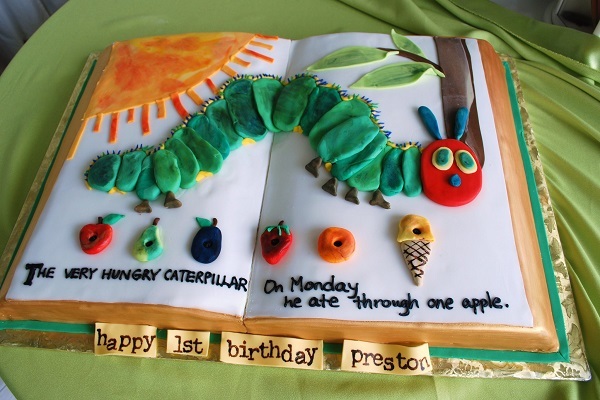 It brings a unique twist to the conventional birthday parties. 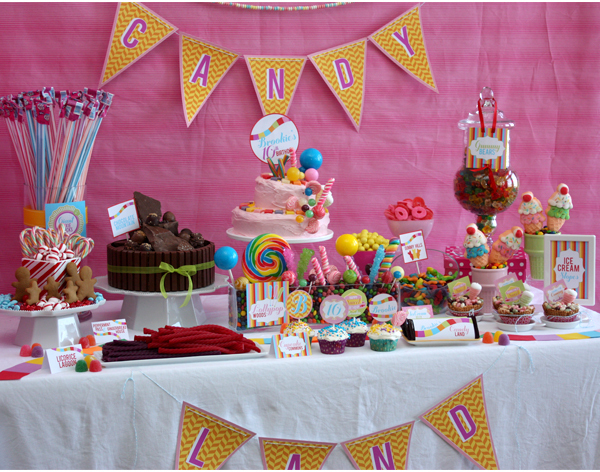 This birthday party theme will keep your guests busy while they have fun. The crafts themed party does not require any financial investment. You only need some glitters, paints, and fabrics. The kids will leave the party with things made in their individual style. So gather your safety scissors and crepe paper for an unforgettable party. Present the guests with some paints, sparkles, markers and other decorative items. Purchase some unfinished items like T-Shirts, bags, picture frames and unpainted pottery. Make sure that you get the products are as plain as possible so that they make a nice blank canvas for painting. Take some colorful tissue papers and cut it into circles and squares. Then stick to the vase using hot glue. Kids can also make flower branches to stick to the vases. There could be nothing more fun that a princess party with sparkles, tiara, and tulle skirts. It is guaranteed to delight your little princess and the entire little belle at the ball. 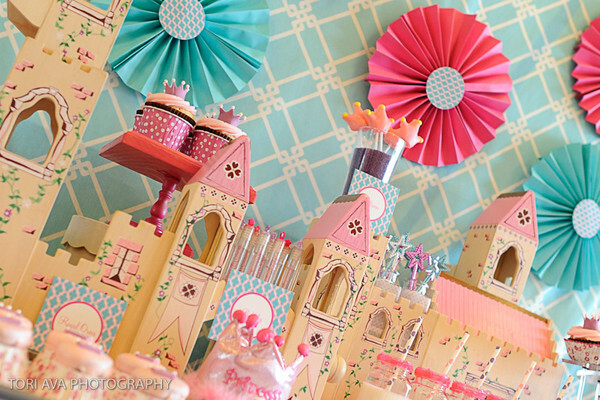 For a princess birthday party, you would need princess costumes, tiaras, teacups, jewelries. Decide on a fairy tale theme like Cinderella or Tangled and get started. Creative invitations set the mood and build the excitement for the party even before it starts. If you are creating the card yourself, then fold a construction paper in half and stick a picture of your child’s favorite princess. Write all the details of the party inside. If you do not have time to make invitation cards, then you can consider getting it done by the publishers. For a happening birthday party, transform the party area into a glitzy ballroom. Place a grand pink carpet leading into the party. Hang some pink and lavender balloons and streamers from the ceiling. You can also hand cut out of glitter paper from the ceiling. Also, decorate the house with Disney princess’s posters around the venue. Decorate the dining table with pink tulle fabric and sprinkle some silver stars on it. Use silver cutlery and napkins. The food should fit the theme of the party. Do not forget to prepare some “royal treats” for your little princess and her girlfriends. Sprinkle some rose petals and glitter confetti on the food table. Cut traditional rice cereals treats in star shapes with the help of a cookie cutter to create fairy wand snacks. Insert a pretzel rod about an inch for the handle. Cut the sandwiches in heart and star shapes to serve the guests. You can also consider serving strawberry with chocolate sauce. Serve strawberry milk or chocolate milk in dainty teacups. 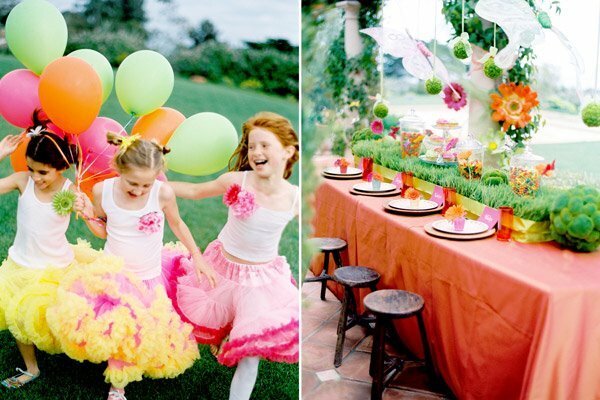 These party themes will surely leave a lasting impression in your daughter’s memories. Do not forget to share your experience with us. We will be waiting for them.